Tube complement: 1R5 mixer/oscillator, 1U4 IF, 1U5 detector, 3V4 audio output. Approximately 6-5/8 inches / 168 mm wide. "A powerful loop antenna is built right into the handle. 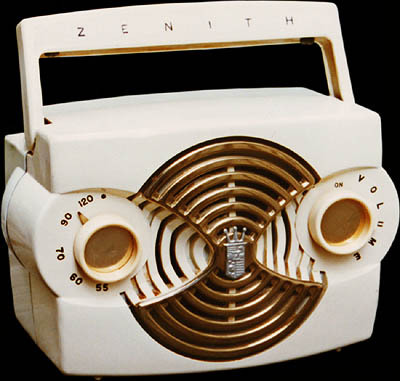 This 'Hand-Tenna,' a Zenith exclusive, extends distance, cuts static." 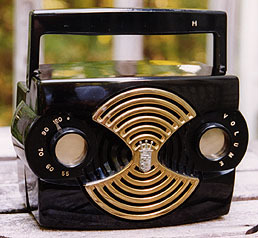 This radio uses 1.5-volt-filament tubes (without cathodes), which are more commonly used in battery-powered portables. 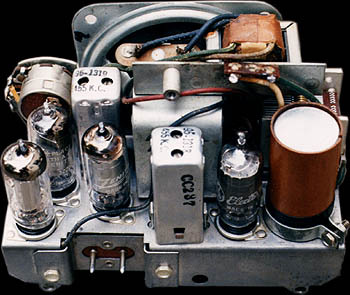 Just like the earliest tubes (also cathode-less) and the later transistors, these tubes come on almost instantly—no waiting for the radio to "warm up." This particular model (the W in the model number stands for white, no doubt), is white enamel paint over Bakelite. 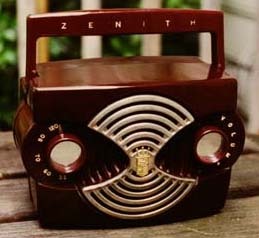 This is a K412-R, unpainted maroon Bakelite. And a K412-Y, unpainted black Bakelite. The "dawn grey" model (paint over Bakelite) completes my collection of all four colors. It's model K412-G.